The International Space Station and a European cargo-carrying spacecraft are locked in a cosmic dance, and you can see it all unfold right from your own backyard. 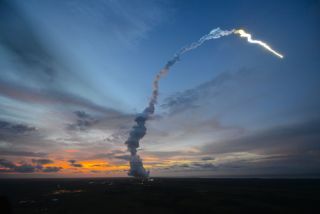 The European Space Agency's bus-size Automated Transfer Vehicle-4 (ATV-4) — a space cargo ship loaded with food, rocket fuel and experiments — launched toward the space station last Wednesday (June 5). This week, weather permitting, you can see both the station and the ship (named "Albert Einstein") pass overhead. The appearance of either the International Space Station or an ATV cargo ship moving across the sky is not unusual. On any clear evening, within a couple of hours of local sunset and with no optical aid, you can usually spot several Earth-orbiting satellites creeping across the sky like moving stars. Satellites become visible only when they are in sunlight and the observer is in deep twilight or darkness; this usually means shortly after dusk or before dawn. What makes this week’s prospective passages so interesting is that you’ll be able to see the ATV-4 gradually "chase down" the space station around the Earth, ultimately catching up and docking with the orbiting outpost. Docking is scheduled for Saturday (June 15) at 9:46 a.m. EDT (1346 GMT). Both vehicles will appear to travel across the sky along the same path, and the gap between the two will diminish as the week unfolds. Today (June 10), they are separated by about 42 minutes; by Wednesday, they’ll be 36 minutes apart and, by Thursday, 20 minutes apart. But on Friday evening — mere hours before docking — they will be flying in close tandem with each other. Resembling a pair of bright "stars," the International Space Station will shimmer brightly and seem to lead the dimmer Albert Einstein across the sky. The space station is, by far, the largest and brightest object currently orbiting the Earth. It shines as brightly as Jupiter and can occasionally even rival Venus in brilliance. Traveling in their respective orbits at 18,000 mph (29,000 km/h), both should be visible for about one to four minutes as they glide with a steady speed across the sky. Although the "chase" will be visible in many parts of the Northern Hemisphere, it will be difficult to spot in parts of the southern United States (particularly in Florida and the Gulf Coast region), as the few (if any) passes will occur before sunset in the daytime sky. So what is the viewing schedule for your hometown? You can easily find out by visiting Chris Peat's Heavens Above or NASA's SkyWatch. Each website will ask for your ZIP code or city, and will formulate a list of suggested spotting times. Predictions computed a few days ahead of time are usually accurate to within a few minutes. They can change, however, due to the slow decay of the space station's orbit and the periodic reboosts to higher altitudes. Check frequently for updates. Another website, N2YO.com, tracks more than 8,000 satellites in real time. Check out the website's sidebar for additional data, including the satellite's speed, elevation and altitude. The sidebar also provides a forecast (with a corresponding map) of any given satellite's movements in the next five days. Editor's note: If you snap an amazing picture of the space station and the cargo ship — or any other night-sky view that you'd like to share for a possible story or image gallery — send photos, comments and your name and location to Managing Editor Tariq Malik at spacephotos@space.com.